Welcome to the 50th installment of Movies You Have Not Seen But Should. 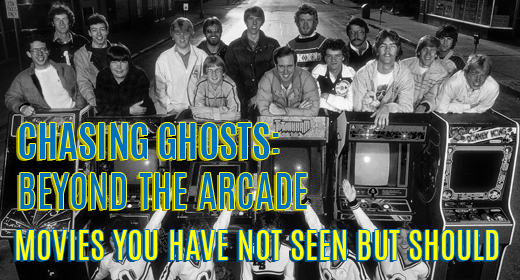 This week we will take a look at the 2007 documentary Chasing Ghosts: Beyond the Arcade. The film travels back to the 1980s and examines the rise of video games and arcade games. The early 80s were the biggest time for arcade games and with that came the rise of the “highest score” gamers. People would shoot for the highest score and the recognition that would come with it. Someone who took advantage of that was Walter Day. Day was an entrepreneur in Ottumwa, Iowa and was the owner of the Twin Galaxies arcade. Day wanted to be the one stop for collecting high scores and being the World Champ in particular games. So he did just that. In 1982, he launched Twin Galaxies International Scoreboard. In addition to the film telling the story about Walter Day and Twin Galaxies, it also tells the story of several teenagers who were vying for the highest score of several games. These teenagers along with Walter Day were featured in a story in Life magazine in 1982. There is archived footage of these video game players, as well as present day interviews of several of them. One who is featured is Billy Mitchell, a famous video game player who appears in a previous Movies You Have Not Seen But Should film The King of Kong: A Fistful of Quarters). The video games that are highlighted include Donkey Kong, Donkey Kong Jr., Centipede, Defender, Joust, and Pac-Man. The film premiered at the Sundance Film Festival on January 19, 2007. It was also featured at the Los Angeles Film Festival, as well as at the Austin Film Festival. Chasing Ghosts: Beyond the Arcade is available on DVD and Amazon Instant Streaming. If you’re a fan of video games, you’ll love this film. If you’ve seen King of Kong, this one is worth checking out as well. This is a fun documentary that you may not have seen, but you should. Are You Ready For iPhone 6? John Alsbrooks-Kaleb Kastle liked this on Facebook.